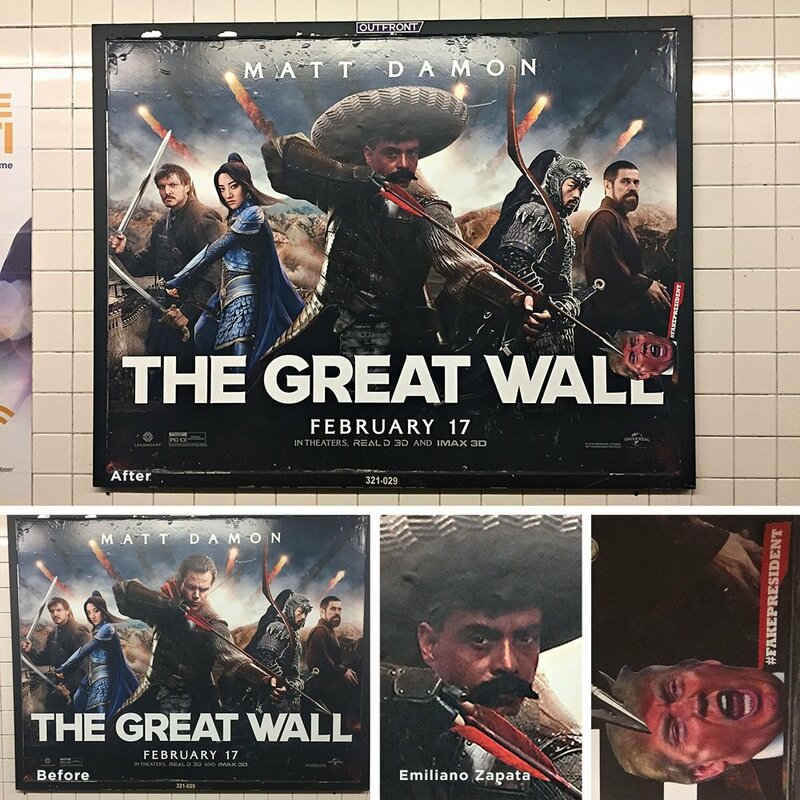 Alterations of "The Great Wall" movie posters in New York City subway stations.Emiliano Zapata cutouts covering the face of Matt Damon. Fake President added. 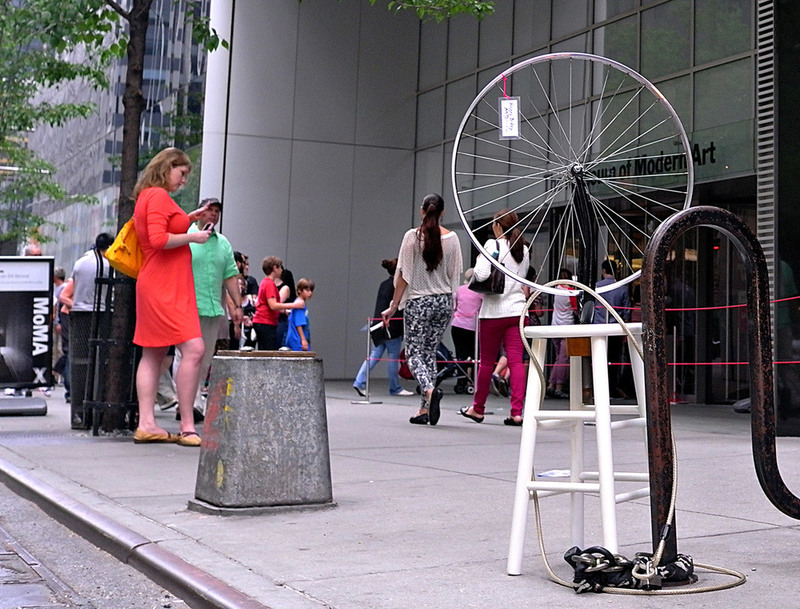 I placed a facsimile of Marcel Duchamp’s Bicycle readymade in the bicycle racks in front of MoMA in honor of his birthday: July 28, 1887. The piece barely lasted one day before it was forcibly removed by MoMA staff. 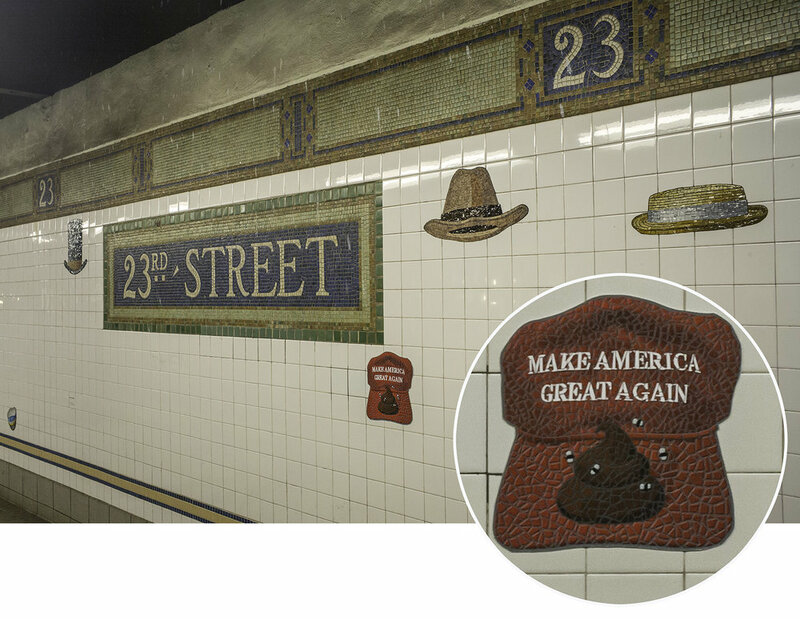 The original created by Duchamp is lost, and the one in the museum is also a facsimile. On the first day of Spring 2013, I posted my translation of Arthur Rimbaud’s poem “After the Flood” throughout my neighborhood of Red Hook, Brooklyn which was impacted by hurricane Sandy the year before. 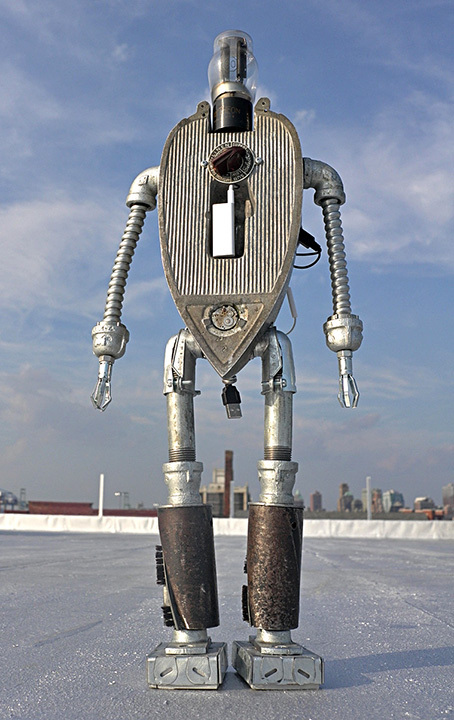 Robot made from parts of Old Radio, Iron, Watch, and Hoover vacuum cleaner. It has a new i-pod in the center with an amplifier and speakers. The i-pod is programmed with robot-themed music. In Greek mythology Hermes is the messenger of the gods and a Psychopomp or guide to the Underworld. 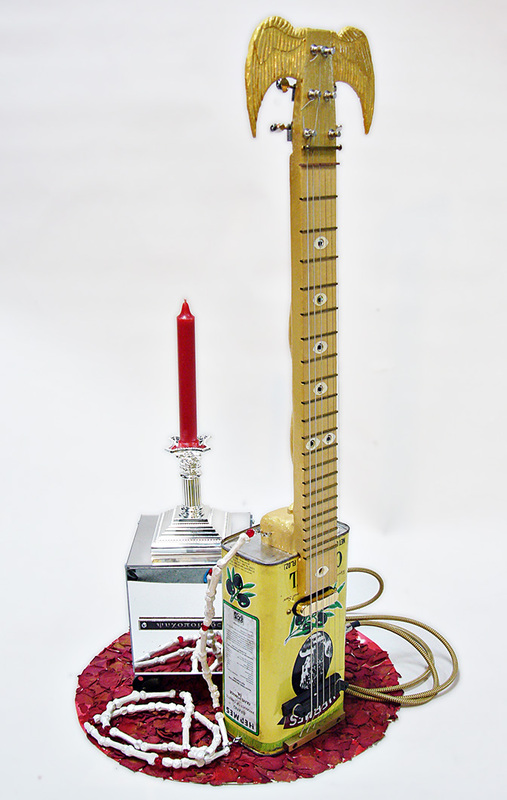 I made an Electric guitar from a Hermes Olive Oil can, the neck carved with entwined serpents with an Amplifier in a mirror box on wheels with a candle, a Guitar Strap made from carved finger bones, and a circle of rose petals. Old Radio with interior parts gutted and replaced with new amplifier, speaker, and an ipod filled with Opera and Jazz music. Gift for my parents. 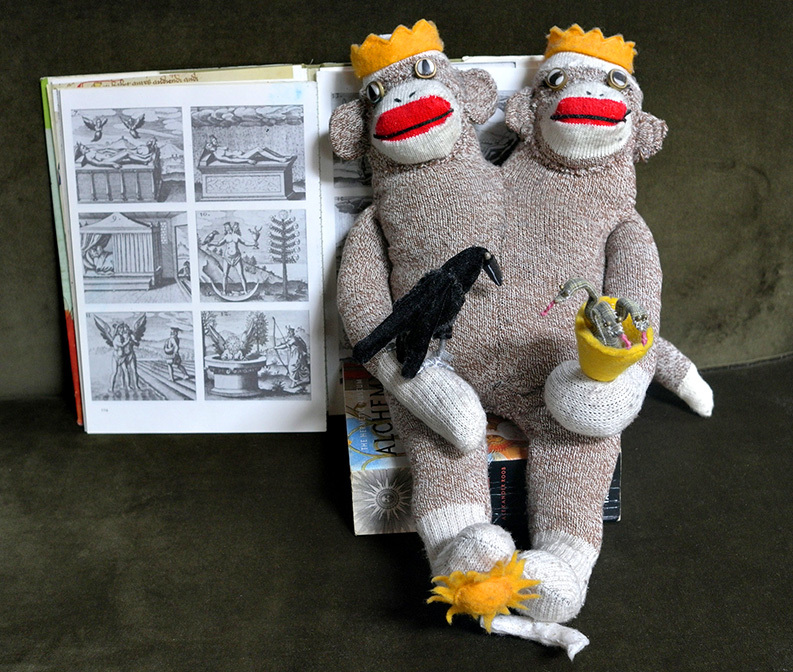 Sock Monkey based on Alchemical Drawings of the union of the Sun & Moon. They hold a Black Bird and a chalice of three snakes. They stand on the sun with one foot and the moon on the other. Gift for Carmella. 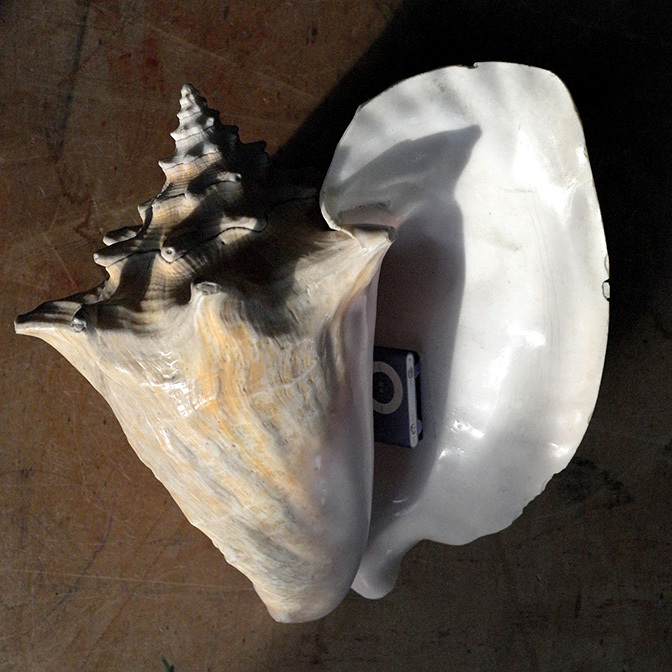 You can listen to the sounds of the ocean with this shell — recorded sounds of waves, whales, as well as ocean themed songs and shanties.